Autumn has definitely arrived at Whitefish Bay Farm. Temperatures have cooled down slowly. We have toyed with frosts on a couple of mornings, but not seriously enough to end the growing seasons of any plants. More significantly, we have experienced frequent and sometimes heavy rainfalls. This has been such a contrast to middle and late summer when we dried up to nearly drought conditions. The sheep are now grazing on our big hay field, but there have been a number of days in late September and early October when we have kept them in the barn due to the heavy rains. Our vegetable garden has had its normal schedule thrown for a loop due to the dry hot weather of July and August followed by the very wet and cooler days and nights of September and early October. It became impossible to keep up with the tomato crop, and the peppers and eggplants were right behind in production. We have frozen numerous quarts of sweet peepers and pasta tomatoes. In addition we made a large supply of tomato sauce. I managed to get all of our dried beans harvested but had to give them some extra time in a warmer and drier basement before I could get the beans out of the pods. 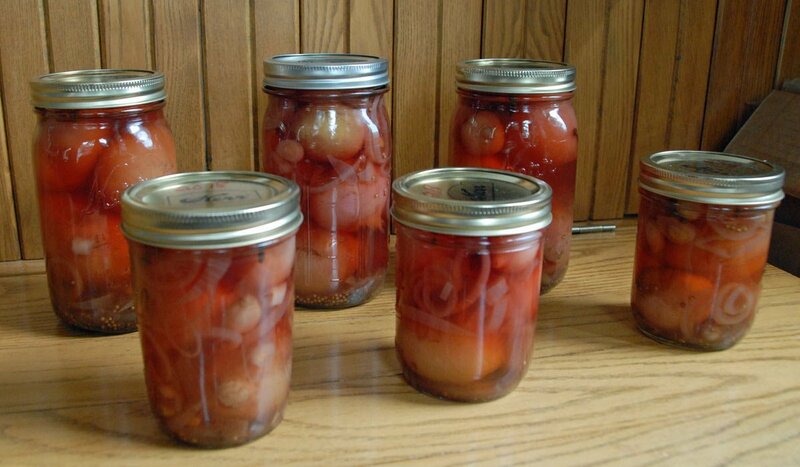 Our canning tools have also had a workout. So far, we have put up 6 quarts of pickled jalapeno peppers, without making a dent in the overall production of just three plants. A couple of weeks ago we picked all of the smaller size beets. 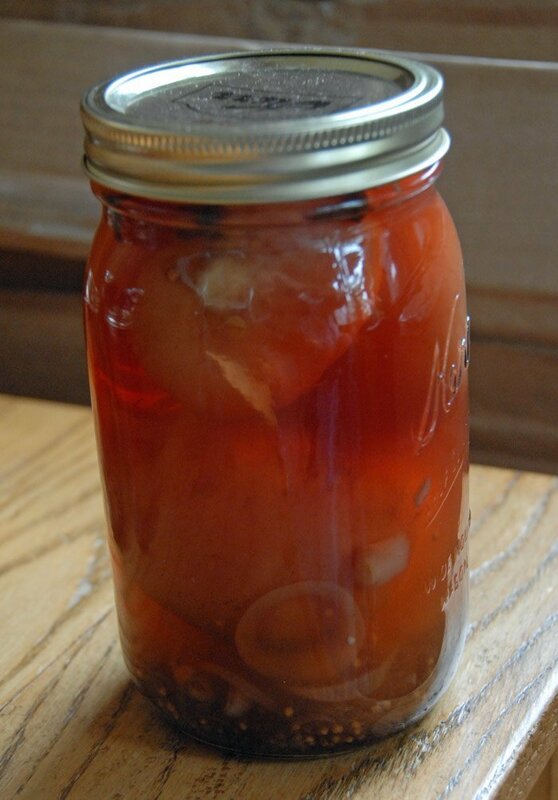 We now have a new 7 quart supply of spicy pickled beets. We grew two varieties of beets this year, one which is yellow and the other is red and white striped. In the sun, the pickle jars are a lovely mix of shades of oranges and reds. I look forward to the pickled beets this winter, as a frequent contributor to smørrebrød (open faced Danish sandwiches)! By early October the fruit on our aging apple trees was ripe enough to pick and make into apple sauce. It was a race to get a good collection of apples before we experienced a few days of very strong winds. Much of what I did not or could not pick got blown off the trees (much to the delight of our local deer population). 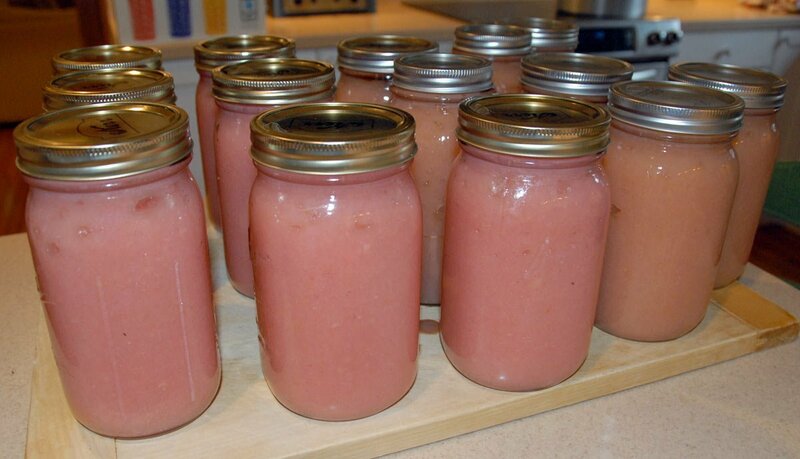 We managed to put up 14 quarts of apple sauce. We harvested enough apples that we had to make two separate batches of sauce. Our trees are a collection of at least seven different varieties. When cooked down and made into sauce the different apples produce different colors. As can be seen in the photo, this year we got an especially lovely shade of pink/red, in addition to the more common tan color we often produce. Sadly, many of the trees are beginning to show significant amounts of fire blight. I suspect that at least two of the trees will not survive next spring and the rest will follow in the next couple of years. Therefore, we especially value the sauce they produced this year. Our lives here have not been all work of late. I recently purchased a drone. My “excuse” was that I wished to document our woods when they got into fall colors. We are beginning to see significant inroads in our ash trees from Emerald Ash Borer beetles. I already know that we are going to loose a number of trees this year and future years will not show any respite. What better way than to see the changes in the woods than from a bird’s eye view. I am still mastering the skills of flying while filming. Hopefully I will have some better efforts to share in the near future. This is my first successful effort at a still image. 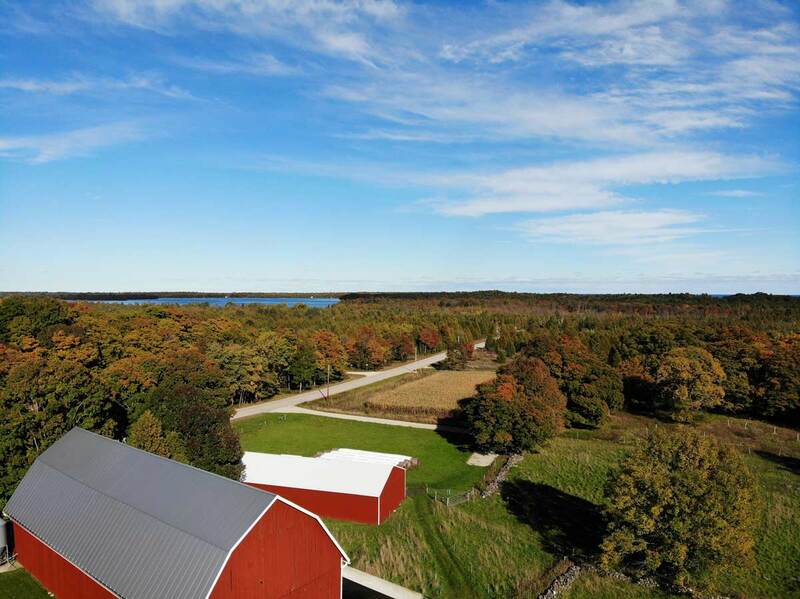 The view is from just above the house and barns, looking to the northeast, over the mixed woods toward Clark Lake and Lake Michigan beyond. There were already nice fall colors developing when this was taken. I hope I can share some even more exciting views in the near future. wow! glad to see all is well at WFB farm! Mmmm… beets! Great job on the drone picture. what a lovely view from up there.